This time I am checking two great guitars, a Suhr MK-1 and a Pensa MK-1. 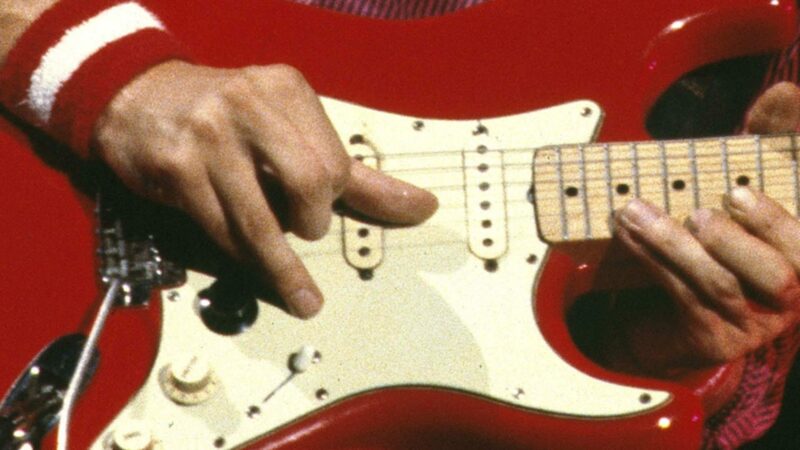 The Suhr is the one that you could already see in this video. Both belong to the same person, a collector from Germany. 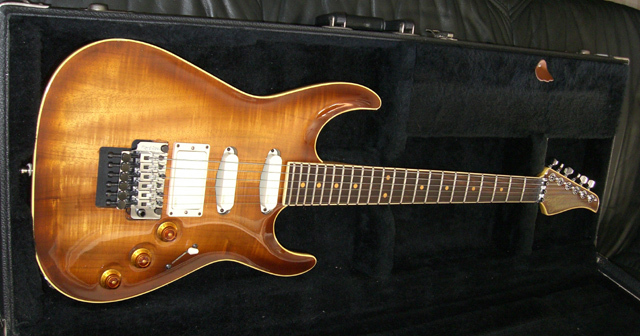 The Pensa-Suhr MK1 was built in 1988 by luthier John Suhr at Rudy Pensa’s guitar shop in Manhattan. Suhr worked there before he built amps with Bob Bradshaw and became master builder at Fender’s Custom Shop. 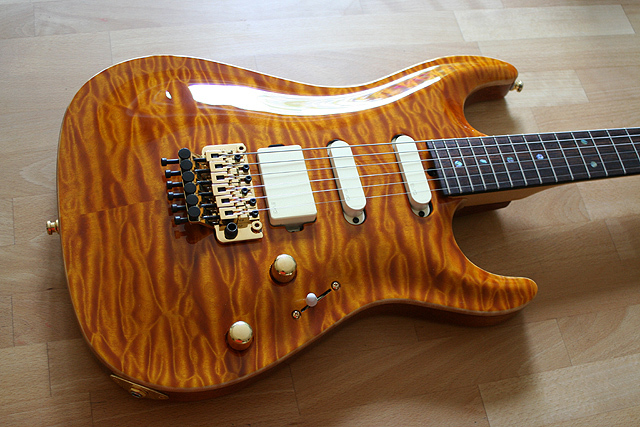 Later he started his own company – Suhr guitars. 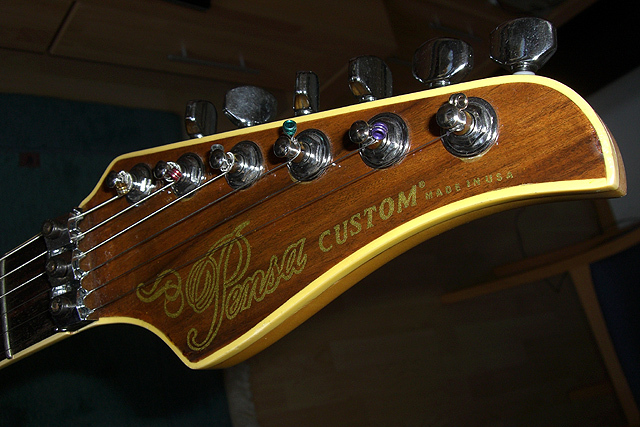 For this reason the first guitars were called Pensa-Suhr, and after John left simply Pensa. John Suhr also builds guitars similar to the MK-1 (although for legal issues he has to change some details) – if you want a MK-1 you basically have to decide if you want it from the same place or from the same builder. 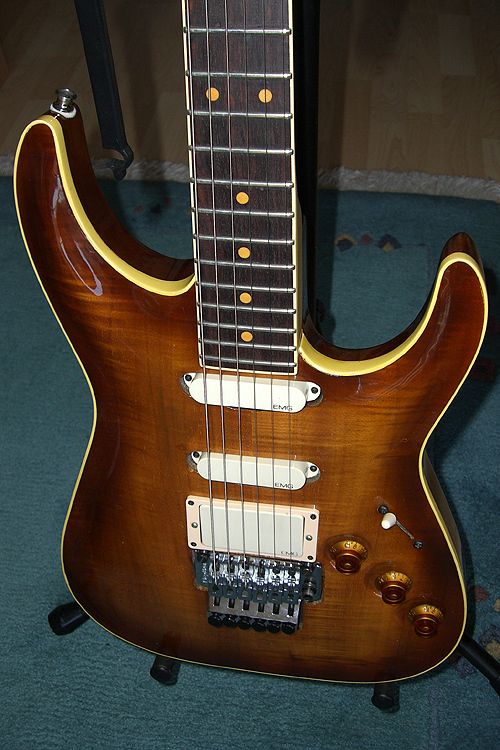 This wonderful guitar is from 2006. Note that apparently for legal reasons the official name of this guitar is not MK-1 – only Pensa are allowed to use this model name. 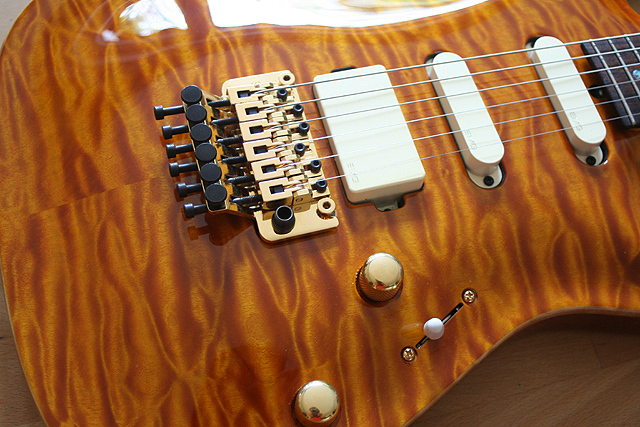 It has a mahogany body with a 3/4″ quilted maple top, a maple neck with Indian rosewood fingerboard, Floyd Rose tremolo, abalone dots, EMG pick-ups etc. The top of the guitar is really astonishing – almost three dimensional. We found it sounds darker and warmer than the Pensa. In this youtube video you can see me playing both of them – including riffs from Money for Nothing, Heavy Fuel, No can do, …. The guitar goes directly into the amp, the distortion is from the amp – a Music Man RP112 65. The SPC mid-boost is enabled on both guitars. Those are great. I’ve always wanted one, and I’ve looked into buying one and I’ve looked into building one. Both were rather expensive, especially buying Pensa. Which did you prefer, Ingo? I want my guitar made like that.